Photo: nest hotel Co., Ltd.
You just flew 14 hours and halfway around the world. The overnight flight to South Korea’s Incheon International Airport made your legs feel like noodles and your stomach grumble. Unfortunately, you aren’t done yet. This is just a connection. You have another seven-hour flight ahead of you. But that doesn’t leave until tomorrow morning. You need to escape the airport. Incheon International Airport sits on Yeongjongdo. The island was known for its beaches and temple before one of the largest airports in the world was constructed in the 1990s. It lies off the west coast of Incheon. South Korea’s third-largest city is an important historic (Russo-Japanese War, Korean War) and economic (the country’s first free economic zone) center. It also provides easy access to the capital. Seoul is less than an hour away on the Airport Railroad Express (AREX). But Seoul isn’t your focus. Right now, you just need a comfortable bed, a hot meal, and a stiff drink. Nest Hotel can do better than that. 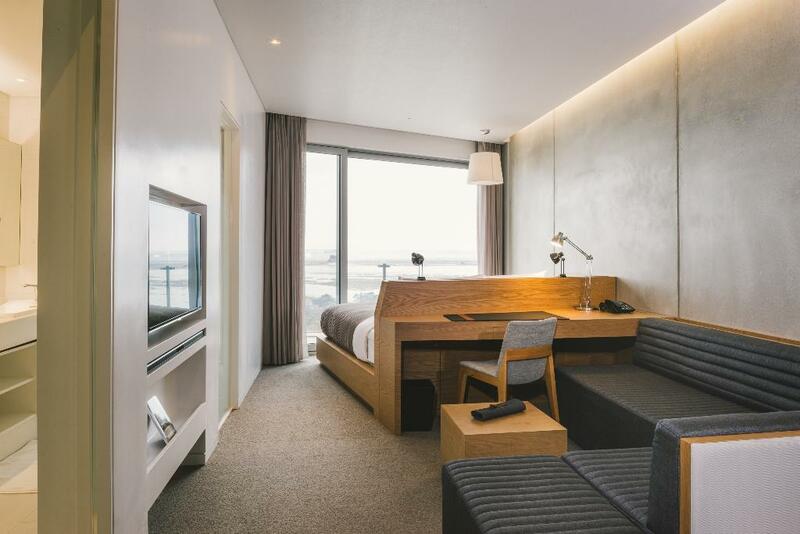 The design hotel—yes, there’s finally a design hotel near an airport—opened a few years ago along the Yeongjongdo waterfront. The striking cubist-modernist building actually looks like a nest on the outside. A high ceiling, glass walls, and lots of exposed concrete fill the lobby. The understated rooms are decorated with Japanese cypress, raw stone, and gray fabrics. A deluxe room even features views of the Yellow Sea from both the double bed and the bathtub. A free shuttle will meet you at the airport. The hotel is just a 15-minute drive from there. Though you’re tempted to immediately pull the curtains and crawl into bed, you know that you need to stay awake for at least a few more hours. So you take a bath and look out over the calm water and the nearby islands. After you wash away the stale airplane smell, you decide to head to the sauna to further loosen your tight muscles. The open-air bath, surrounded by large gray stones, lets in fresh air and sunshine through an opening in the ceiling. Eventually, you return to the lobby for a bespoke cocktail in the library-like Kunst Lounge and a hearty Korean meal in the Platz, a tiered restaurant with white marble and floor-to-ceiling windows. By the time you finish dinner, you’re barely able to keep to your eyes open. It’s time for bed since you need to be back at the airport in just a few short hours. Nest Hotel turned out to be a perfect respite during your long journey. Next time, it’ll be your home base to explore more of Incheon.